This week we have a double Torah Parsha… Vayakhel and Pekudei. 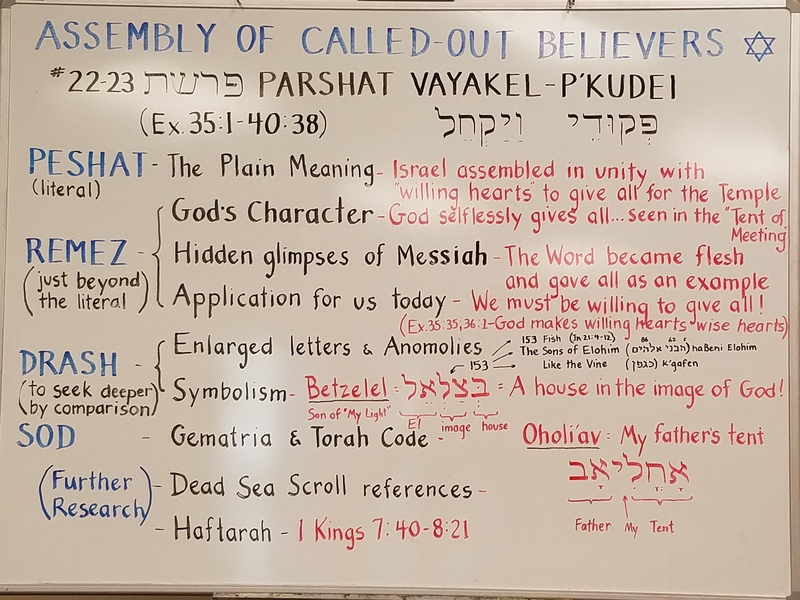 Vayakhel (וַיַּקְהֵל‎) — Hebrew for “and he assembled,” is the 22nd weekly Torah portion (פָּרָשָׁה‎, parashah) in the annual Jewish cycle of Torah readings. The parashah tells of the making of the Tabernacle and its sacred vessels. It covers Exodus 35:1–38:20. Pekudei (פְקוּדֵי‎ ) — Hebrew for “amounts of,” is the 23rd weekly Torah portion in the annual Jewish cycle of Torah reading and the 11th and last parsha in the Book of Exodus. The parashah tells of the setting up of the Tabernacle. It covers Exodus 38:21–40:38. Moses assembles the people of Israel and reiterates to them the commandment to observe the Shabbat. 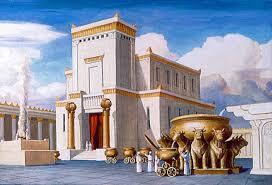 He then conveys God’s instructions regarding the making of the Mishkan (Tabernacle). The people donate with unified “willing hearts” the required materials in bringing gold, silver and copper; blue-, purple- and red-dyed wool; goat hair, spun linen, animal skins, wood, olive oil, herbs and precious stones… so giving were their willing hearts that God mentions it four times like a proud father and Moses has to tell them to stop giving! A team of wise-hearted artisans make the Mishkan and its furnishings (as detailed in the previous Torah readings of Terumah, Tetzaveh and Ki Tisa): three layers of roof coverings; 48 gold-plated wall panels, and 100 silver foundation sockets; the parochet(veil) that separates between the Sanctuary’s two chambers, and the masach (screen) that fronts it; the Ark and its cover with the Cherubim; the table and its showbread; the seven-branched menorah with its specially prepared oil; the golden altar and the incense burned on it; the anointing oil; the outdoor altar for burnt offerings and all its implements; the hangings, posts and foundation sockets for the courtyard; and the basin and its pedestal, made out of copper mirrors. An accounting is made of the gold, silver and copper donated by the people for the making of the Mishkan. Betzalel, the son of Uri (name means “under the shadow of Elohim”, son of “my light”), of the tribe of Judah, the grandson of Miriam, the sister of Moses, and Oholiav, the son of Ahisamach, of the tribe of Dan and their assistants make the eight priestly garments—the ephod, breastplate, cloak, crown, turban, tunic, sash and breeches—according to the specifications communicated to Moses in the Parshah of Tetzaveh. The Talmud in “Sanhedrin 696” says that Betzelel was only 13 years old when God imbued him with “wisdom of heart” as an artisian for the tabernacle! When the Mishkan is completed, all its components are brought to Moses, who erects it and anoints it with the holy anointing oil, and initiates Aaron and his four sons into the priesthood. A cloud appears over the Mishkan, signifying the divine presence that has come to dwell within it. Both the Torah parsha and the haftarah in 1 Kings 7 report the leader’s building of the holy place, Moses’ building of the Tabernacle in the parsha, and Solomon’s building of the Temple in Jerusalem in the haftarah. Both the parashah and the haftarah also note the particular metals for the holy space and the skill (chokhmah), ability (tevunah), and knowledge (da‘at), of the artisan (Bezalel in the parashah, and Hiram in the haftarah) in every craft (kol mela’khah).